The client contracted Skat Consulting Ltd. to carry out a stakeholder mapping and policy analysis exercise of the WASH sector in Bhutan, with a focus on stakeholders involved in household water treatment and storage systems (HWTS). Previously to the assessment, there were contradictory claims on WASH status and need for HWTS in Bhutan. The mission report looked at what the government data stated and what the stakeholders perceive on the above two subjects, it mapped the main actors in the sector and showed their relations. Moreover, it also provided an overview of existing products and methodological approaches. Based on the findings of the assessment, a series of recommendations were made to provide evidence to the client for its strategic decision making..
Project Officer: Sanjay K Gupta – Water, Sanitation and Waste Management Specialist. A report summarizing the findings of this study was submitted to Solaqua Foundation for internal use and decision making on funding and geographic focus. 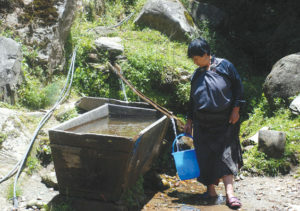 The report made recommendations to Solaqua analyzing the potential impact and effectiveness of WASH projects in Bhutan, based on the assessment of the field visit and other available data. The report also makes a recommendation for primary data collection.